Yesterday the World Changed. Thank you! As all regular followers of this site know by now, I have been tirelessly working to help promote the Not Evil message and get the good word out to as many folks as possible. As well as plugging the film at every opportunity and helping to organize the Vancouver public premiere, I’ve also been doing my part offline by encouraging friends and family to get involved. I’m happy to report that on Sunday October 18 2009, the world did indeed change. For the better. 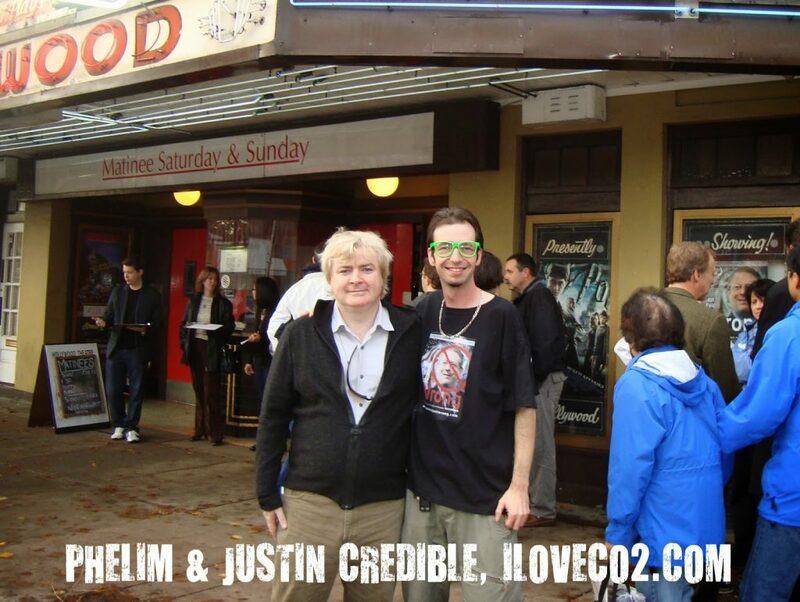 Here at the Vancouver premiere which took place at the Hollywood Theatre, we had a lineup down the block half an hour before showtime. An excited, diverse crowd, and even just some passerby wondering why Al Gore’s portrait on the movie poster resembles the Joker and therefore became curious enough to stand in line and check it out. At five o’clock the lights went down and history was being made worldwide simultaneously. The film played for 90 minutes, and as the credits rolled it was easy to determine the reaction from the crowd. People who have been waiting a long time for this night were very pleased with the final product, and many other people, perhaps some who had not even heard of the film until yesterday, were suddenly re-examining their way of thinking. I swear, you could almost hear the sound of opening minds echoing throughout the building. 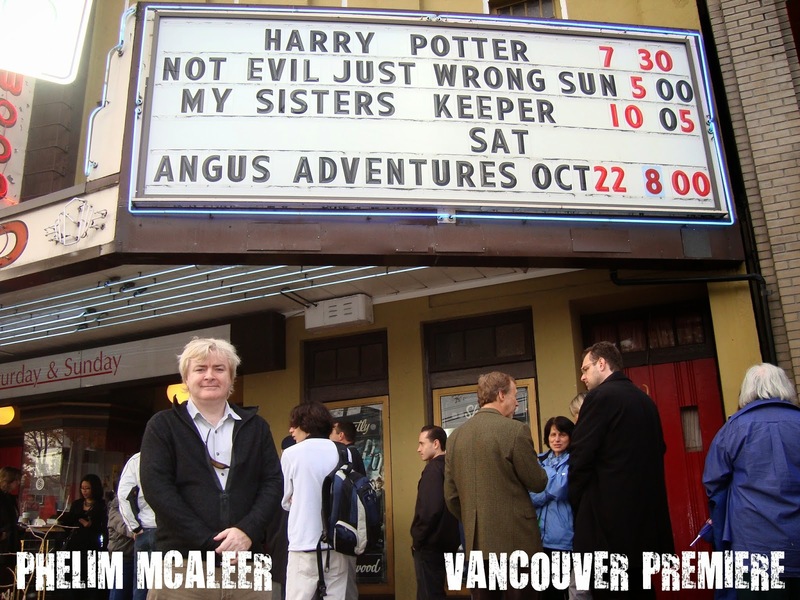 This was a very special premiere for Vancouverites. 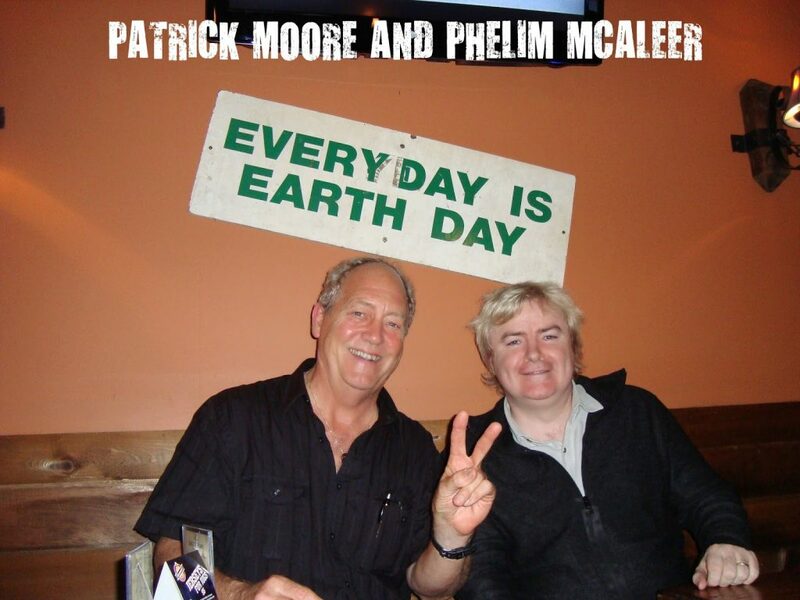 Some lucky moviegoers got their chance to speak with Director/Producer Phelim McAleer, Executive Producer Barton Sidles, and our guest of honour Patrick Moore, founding member of Greenpeace, both at the cinema and at a special meet ‘n greet afterwards. 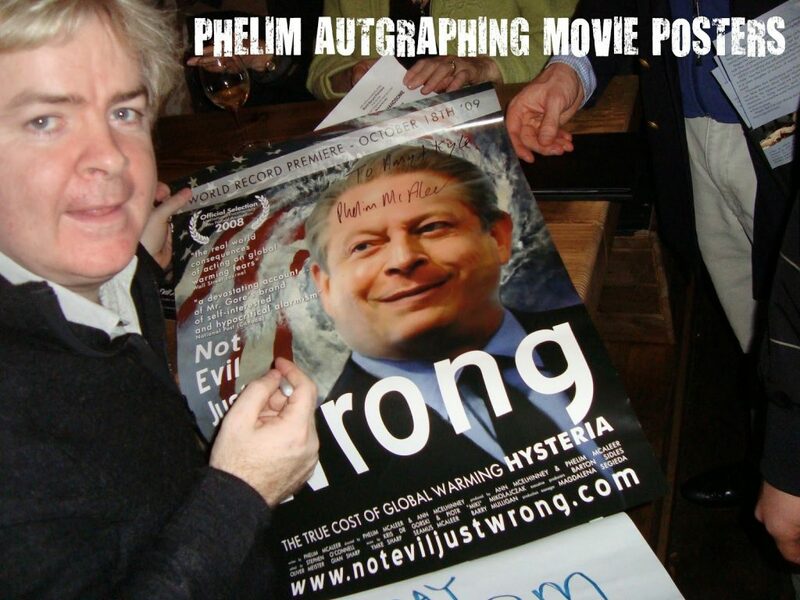 Phelim was busy signing copies of the DVD for guests, and even penned his name on a movie poster for a little girl who is obviously not fretting over mythical dying polar bears or suffering from unfounded eco-anxiety. Which is a good thing, since there are 5 times as many polar bears today as there were half a century ago, and the planet is certainly not warming. 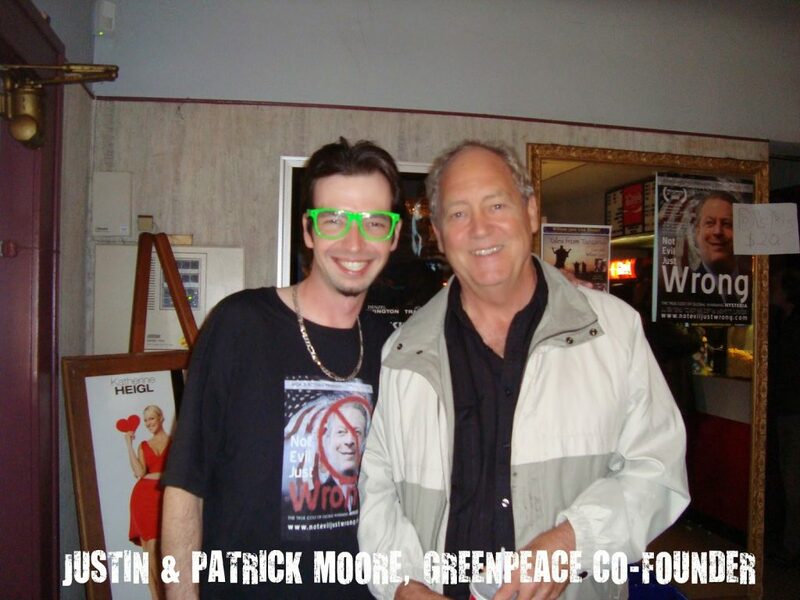 “It’s a powerful film”, said Moore. Thank you Phelim, Ann, Barton, and Patrick for all your efforts. You’ve managed to bring much-needed awareness to the issue of environmental extremism and you’ve exposed the true human cost of global warming hysteria. The momentum you’ve started is only just beginning. And thank you to all the people who participated by attending a screening or watching from home. Together, we stood up for science. We stood up for humanity. 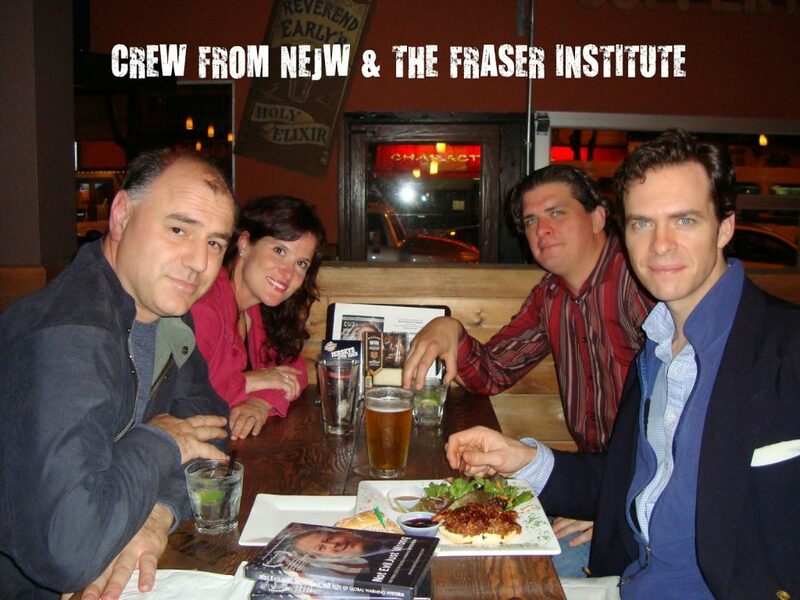 Also a very special thanks to Vanessa Schneider and the crew at the Fraser Institute for all your hard work and support for the Vancouver screening, and all the other Canadian premieres. We couldn’t have pulled off this magical night without you. 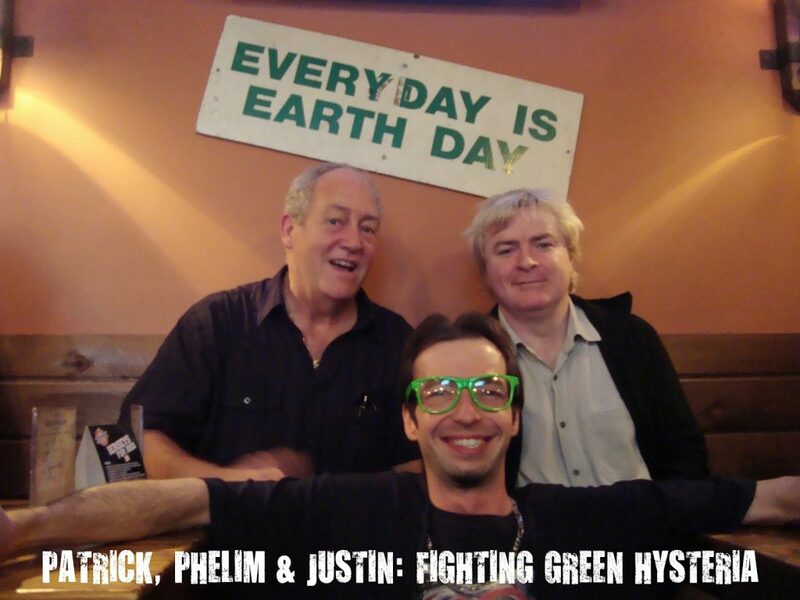 UPDATE: Just three weeks after the premiere, Phelim graced us with his presence once again. I was there last night and enjoyed it thoroughly. Great movie and great Q and A session that followed. Love your site Justin. It was a brilliant film, hard hitting and accurate. The sooner people realize carbon is not their enemy and resist the environmentalist propaganda, maybe all the Al Gore's and David Suzuki's of the world will just quietly vanish. Here's hoping. Now let's please get this film into schools. It is badly needed! Sorry i missed what we are supposed to do about global warming. Do you guys have a plan or do we just sit back and take the piss out of environmentalists until the whole thing falls apart…? Thank you Athlete. I was so happy to see the huge turnout. I'm glad you attended. And Fred, getting Not Evil into schools is the next project already being worked on! You can also buy copies to donate to schools through the shop online link on the top right of this site (it's currently down for maintenance, be patient). Ben, first of all, comments are moderated maybe twice a day at best. Be patient and don't submit extra comments. Secondly, not many sites allow all comments. I allow debate, but not uneducated rants from uneducated alarmists. Your post (which I published) is borderline. You have enough sites for that. Thirdly, to directly answer your comment: "Sorry i missed what we are supposed to do about global warming." Huh? What global warming? Since there is no proven global warming caused by humans and the planet has been cooling for many years, your question is more than extremely silly. Stop and think before you post. the planet has been 'cooling' since 1998 only because that was the hottest year on record. try checking the trend since say 1980 and you will see a very different curve. If there is no proven global warming caused by humans but there is warming caused by whatever – lets say natural variations – we know that co2 increases the temperature, it's garden variety basic science, so why not limit CO2? It doesn't matter who is causing it we just have to stop making the problem worse. Don't we? future phase-transitions in the chaotic object that is the climate. the world will warm as much as the IPCC imagines. merely allowing events to unfold. there is a sound, scientific basis for them. (Sorry if I took up too much space Justin). "With all of the hysteria, all of the fear, all of the phony science, could it be that man-made global warming is the greatest hoax ever perpetrated on the American people? It sure sounds like it." Global warming — at least the modern nightmare vision — is a myth. I am sure of it and so are a growing number of scientists. But what is really worrying is that the world's politicians and policy makers are not. Our CO2 emissions have the same effect on global temperature as you peeing in the ocean has on ocean temperature. yes i see the point about the damage caused by the hysteria. i will look into this guys work a bit more. CO2 has a limit on its heat-trapping capacity and many scientists say we're almost at that limit, which means even if we DOUBLED our CO2 emissions it would literally make zero difference in temperatures. Mankind is moving the carbon from below ground to the atmosphere, where it is available for conversion into living things. This is the most basic elementary science and is an extremely good thing. To try and limit CO2 would be harmful to ALL living things. The lushest and greenest eras of Earth's history had CO2 concentrations far higher than today. That is no coincidence. And that is not something to be feared. Google will lead you to more information on the subject. CO2 is now about 385 ppm, up from 300 ppm pre-industrial. Plants prefer 1200-1500 ppm, about 4 times higher than it is today, see here . The trees are starving out there! For most of life's history the earth has been warmer with higher CO2 than today. Life flourished in these Greenhouse Ages, there was no ice on the poles, all land was tropical and sub-tropical. This is the primary evidence that the global warming scare is unfounded hysteria. Why are there 25 million people in Sao Paulo, Brazil and only 400 in Barrow, Alaska? Thank you for that Patrick. And thank you for joining us on premiere night. It was an absolute honour to have you there.